” https://www.wowhead.com/news=290593/horde-hall-of-fame-for-battle-of-dazaralor-will-close-at-the-end-of-this-reset]Horde Hall of Fame has officially closed” Is listed, rather than just the URL. Not sure if this was intentional or not, but figured I may as well point it out. Nearly 8x more horde kills than alliance, perfectly balanced. Clearly imbalanced between Horde and Alliance…. considering everyone is Alliance for the middle 3 bosses and Horde for last 3. So the imbalance claims is for what? The order of bosses between Champions, Grong and Jadefire? The imbalance is primarily between Mythic raiding populations. Once upon a time (Throne of Thunder, MoP) racials were imbalanced, but now they are all very competitive with one another (barring very short term considerations which affect at most a handful of race-level guilds, such using Goblin Rocket Jump on Mythic Kil’jaeden or Troll’s Voodoo Shuffle for Mythic Jaina, both of which were quickly patched). However, the issue is highlighted in the high end raiding community because of the ease of grouping and recruitment in a bigger faction. 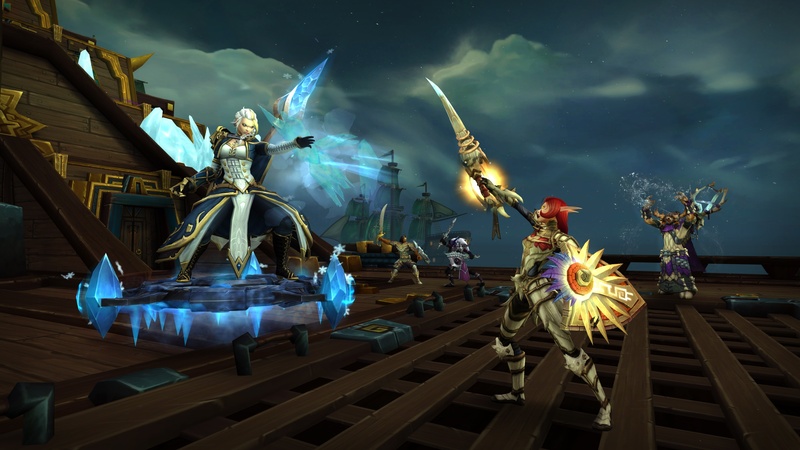 It’s quite simply easier to play with more people, and cheaper to change guilds/servers when the majority are consolidated on one faction, which is a self-perpetuating problem, as more Alliance guilds change to Horde in order to benefit from the greater population, leading to less Alliance guilds and more reason to change to Horde. Unfortunately, there simply is no easy way to fix this problem. Hall of Fame doesn’t do it, because the top 100 guilds will have it regardless if they are Alliance or Horde (and the title isn’t as important as the long term health and recruitment of your guild), imbalancing racials won’t do it unless they’re so imbalanced that it causes everyone to go Alliance instead of Horde which only reverses the problem. The only real solution would be allowing cross-faction grouping, which has several long term considerations for a game centered around a two-faction narrative (though I personally think it’ll still happen eventually). End of the day, it really is one of those problems which is far more complex than it might seem. Best proof is comparison to Hall of Fame in Uldir – since then the amount of Alliance guilds has decreased, not increased. Hall of Fame doesn’t do jack squat to balance factions so it’s completely pointless since it fails at the only purpose it had. Unfortunately, Alliance had the fame of being the weaker faction. Both of them are balanced now, but the long-term damage is already done: most of the people go for Horde simply because most of the people is already there (so the circle never ends). Wasn’t the Hall of Fame pretty similar for Uldir? Alliance was wide open when Horde filled, but the Alliance one filled up as well a lot sooner than I expected based on how it looked at the time. Same thing will probably happen here. Well, Horde has their own racials on last 3 bosses, while Alliance has preset racials. For example undead rogue is better than orc, but dwarf rogue will become an orc rogue. Same for ferals: tauren is better than troll, but elves and worgens become trolls. So there’s still imbalance. Except for 16 guilds so far that have no heart and have been seduced into evil. He may get her killed on LFR but first needs required i lvl to be able queue for it. Exactly, being able to choose your race is a lot stronger than having a random race assigned to you which, in effect, is what Alliance players have for the last three bosses. The overall racial difference is pretty small but think of all those times you have a 1% wipe and end up spending another hour and a half before you kill the boss, especially on progression fights. Now factor in all the times when that same fraction saved something that caused a wipe but you didn’t notice and those small differences can easily add up to costing a guild almost a full raid night each week. Then it compounds, the next week your guild is one boss worth of loot behind so the reclear takes a little longer, maybe you get an extra wipe there that would have been saved with a fraction more gear, now repeat this process for several weeks and it compounds upon itself. It’s why balance is such a sensitive thing when you have repeated content that rewards success with more power, small differences very quickly compound into large differences. For what it’s worth overall alliance did a bit better this time round with 16 guilds finished at this point vs 12 in Uldir. I suspect the 400 items from the Overwhelming Odds quests helped a bit. This achievement could never really do anything to fix faction balance though. I mean to actually consider a faction swap for this achievement you would need to be a Horde guild in the bottom 84 guilds of the overall top 200 guilds. Lets say optimistically that’s about 50 guilds of players. Now you have to have the entire guild willing to pay to faction change (and probably server change too since successful guilds tend to be on realms with a much higher population for their own faction), so you would have to both be in one of those guilds but also high up enough in that list to be very confident that you would get the achievement after swapping so that probably rules out half of the potential candidates. So realistically worldwide there maybe 500 players even in a position to consider this and since it has a very high cost and in return all you get is a chance at a pretty negligible reward it is never going to make a difference to overall populations. But hey, who knows, maybe next tier when all those Kul Tiran humans come along with their 1% versatility while the poor Zandalari trolls are stuck with their choice of five spec appropriate racials (I’m not bitter) and a full heal if they can ever find a few free seconds during the fight it will change. I suspect at some point we could see a world first race dictated by either Regeneratin or Haymaker though. Assuming it works on the adds you could see how Haymaker would have had a big effect on a fight like Aggramar for example. Similarly it seems almost inevitable that at some point there will be a moment where an end boss talks for long enough that the whole raid could regenerate. Either of those racials could potentially gimmick a boss fight in the future. I do wonder if Blizz are getting a bit tired of racials being the deciding factor on final bosses though. Thats two of the last four raids where the world first was decided in large part because of clever use of racials. At some point the number of racial abilities combined with the number of abilities used in complex fights like final mythic bosses makes it almost inevitable that some racial or other will be good enough to give a guild the final 1 or 2% push required to kill the boss.